The Big Apple takes on a whole new look after Thanksgiving as holiday decorations go up around the city. From the décor of homes with their twinkling lights and the hanging star and wreath ornaments dangling from city streets to the extravagant shop displays from Macy’s and Bloomingdales and the grandiose Rockefeller Christmas tree, NYC transforms into a winter wonderland till New Year’s Eve. Following suit are two museums. Every year the Metropolitan Museum of Art and the American Museum of Natural History join in the holiday spirit with their Christmas tree displays. But it isn’t the trees themselves that bring in the multitudes of onlookers and the flashes of the cameras, but rather the ornaments that hang upon them. Many who enter the Metropolitan Museum of Art may be enamored by the architecture of the main hall, and the grandiosity of it, in line with the admiration they have for the art that hangs on its walls. But amongst the sculptures in the Medieval Sculpture Hall stands another work of art – a 20-foot blue spruce tree with over 50 dangling figurines of angels decorating it. On the floor sits a beautiful scene of the nativity with townspeople, animals, and the Magi gathering to see the birth of baby Christ, which stands as the core element of the installation each year guiding the diverse showcases. With all the figures measuring in height from 6 to 20 inches and wearing perfectly stitched and handcrafted clothing, the display is nothing short of a work of art. What is more interesting is that the intricately detailed angels, who are adorned in diverse colors, do not hang on the tree themselves. Instead they are suspended from individual rods with lights making their flight a truly spectacular one. According to the MET, the tradition started with the late Loretta Hines Howard who collected these crèche figurines and eventually passed the entire collection on to the museum in 1964, though she had been bringing in her figurines for numerous years prior. Her first three figures, from an 18th Century crèche, were given to her by her own mother after she was married. They consisted of Mary, Joseph, and baby Christ, giving birth to her fascination with the nativity scene. Her collection welcomed new members on her honeymoon when she started to look for other cherubs to add to her then small assortment. Now in its 54 year, the tradition is continued by her daughter, Linn Howard, and her granddaughter Andrea Selby. “In 1952, Frances Henry Taylor, who was Director of the Metropolitan Museum, told mother about an extraordinary 18th-century crèche called The Adoration of Angels. He had seen it exhibited in Paris. It belonged to Eugenio Catello whose family museum of crèche figures in Naples was world famous. It took my mother several years to purchase the collection and when it arrived, she placed the angels in the family Christmas tree,” Howard said. “Mother placed the angels soaring to the top and the colorful pilgrims in the lower boughs. The Museum asked my mother to display the angel tree in the Great Hall. She gave the collection to the Museum for its permanent collection in 1964. This is the 54 year the Museum has displayed the angel tree. My daughter, Andrea Selby, and I continue to create the display each Christmas season,” she added. The entire display is created only by six people – Howard and Selby as well as their team of four assistants. It takes them approximately 14 days to complete the installation as they debate on the placement of the figurines. The collection presently holds over 200 figurines, which for the most part are all used year after year, though some are interchanged as novel ones make their debut. The figurines aren’t the only thing that changes on the tree once in a while. Howard strives to also vary the genre scenes every few years in order to give them an interesting slant and to please those who continuously visit the museum every winter season. “There have been two different bases with many landscape changes and three different trees. Nothing is ornamental. It is art sculpted by leading artists of the 18th-century in Naples who were asked to create smaller versions of their art for aristocratic homes,” she said. According to Howard, many people love the tree display as much as if it were of their own creation. Validating her statement, she says that people often come to watch the installation as it is in progress, fascinated by the concepts and process as much as the terracotta molded decorations themselves. But visitors of the museum aren’t the only ones who enjoy the process and the display. Howard treats the ornaments as if they were her friends, and couldn’t imagine abandoning her mother’s dream. 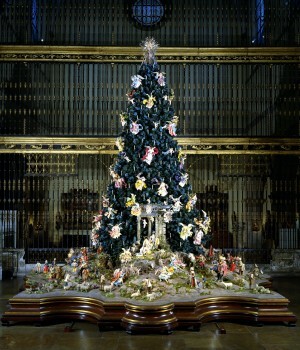 The Christmas tree will be on display at the Metropolitan Museum through January 8, 2012. For museum visiting hours visit http://www.metmuseum.org.